* please note: this article was first featured on my personal blog back on April 11, 2008. It was then requested for use on another crafting blog and was featured there within a month or two afterwards. It was written by me, for my own blog, and therefore I am the author and sole owner of this tutorial. Hope you enjoy it! If you're a scrapbooker you know about 'Scrap Spaces'. You've seen the scrap rooms of the Scrap Celebs. In magazines, online, on blogs...these amazing rooms with custom built-in shelves for each little brad and eyelet. Skylights. Endless work space. Cute little inspirations. Some of my favorite scrap spaces belong to Vicki Boutin and Shannon Zickel. I love seeing these rooms, but they are far from my reality. With two kids and a husband in Masters school, I spent my nights scrapping in a dimly lit, damp and cold, unfinished basement (read: Dungeon) and my scrap storage consisted of whatever I could find on the cheap and make work! Then I stumbled onto this fantastic paper storage solution that improved my organization by leaps and bounds! I did not come up with this concept and I honestly cannot remember where I saw it first. But this is a great solution for anyone....not just the starving college student! 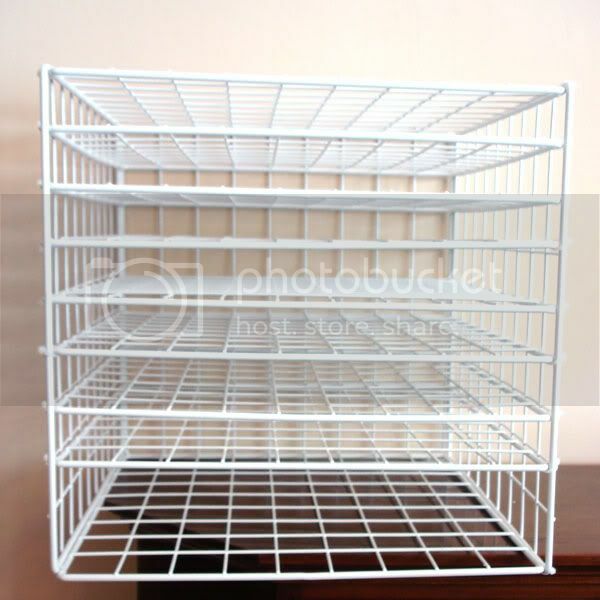 By slightly modifying white wire storage grids you can create a personalized paper storage system which will hold any amount of 12x12 papers in an efficient and very organized way. And it's wicked cheap. I'll go through the steps of making your own here. 1. Start by throwing out the weird little white plastic clips that come with the cubes. You won't be needing these. 3. Next take the remaining white shelves and slide them into your cube and attaching them at 1 inch intervals where the grid already exists. If you need a larger slot for some paper sets just make it a 2 or 3 inch interval instead. 4. 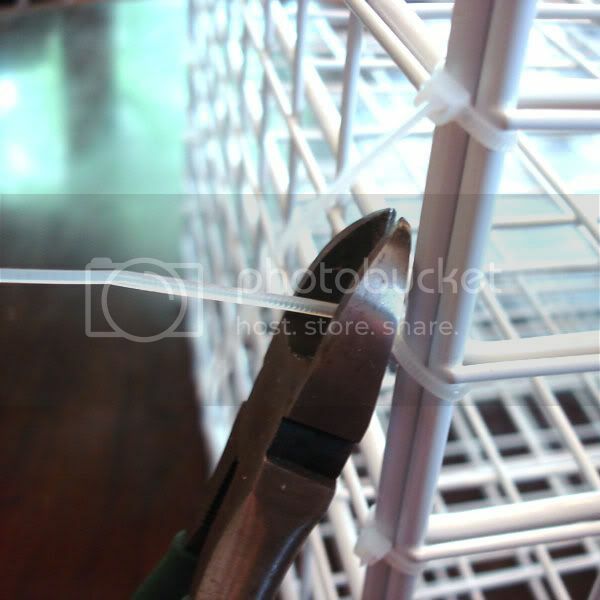 Use your wire clippers to remove excess plastic end from zip ties. Fill with paper sorting by color, manufacturer or whatever makes you happy! Voila! Isn't it genius?!! I made 3 separate cubes out of 2 boxes of these grids and had some grid pieces leftover. I have even given these cubes as gifts to fellow scrapbookers with rave reviews! What do YOU think? At just around $30 for two of these I think they are a steal! And a great solution for organizing a craft area on a budget. What do you think of these paper trays? Are they more or less efficient than the system you are currently using? Do you believe more traditional paper trays are worth the extra expense? We would love to know your thoughts! i had one of these for years. i found that taking a piece of chipboard (the kind that is often at the bottom of a paper stack) and keeping it on the bottom of each shelf helped keep the corners from getting snagged when i pulled the stack out. acrylic sheets also work well. What an awesome idea. And sooo cheap! I'm going to have to try this out. Really appreciate the step by step directions with visuals! Thanks!! These are fantastic! 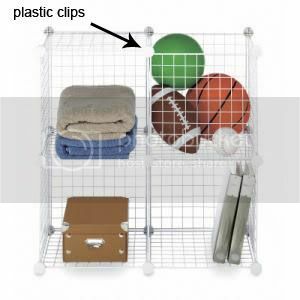 Could really do with some of these - just need to find storage grids in the UK! I made these too in my first scrap space! They totally worked and didn't cost a lot to make! What a great idea. I definitely want to try to make these. I currently use the upright cropper hopper paper holders, but if they're not completely full, the paper tends to slip down and get bent. Great idea, I love it!!!! If you mostly scrap in your room, very cool. I sometimes drag my stuff into the living room to spend time with the hubby, so I need more portable options. I use the Cropper Hopper vertical paper storage, and it works pretty good. Like Amy said, the drawback is that they work better if they are kept full. What a great idea!!! I am fortunate....very fortunate. I have a small room, nothing fancy, but my father built me a cupboard very similar to "The Original Scrap Box". Google it if you haven't seen before it is awesome!! However, with my growing number of stamps, tools and inks, I might have to make some of these for my paper so I can free up space in my scrap box!! I've sen people rave about these cubes for a couple years and never understood how they made them. Thanks for the simple clear instructions. I store my paper vertically right now but it's true if those things are full enough the paper gets ruined. brilliant. 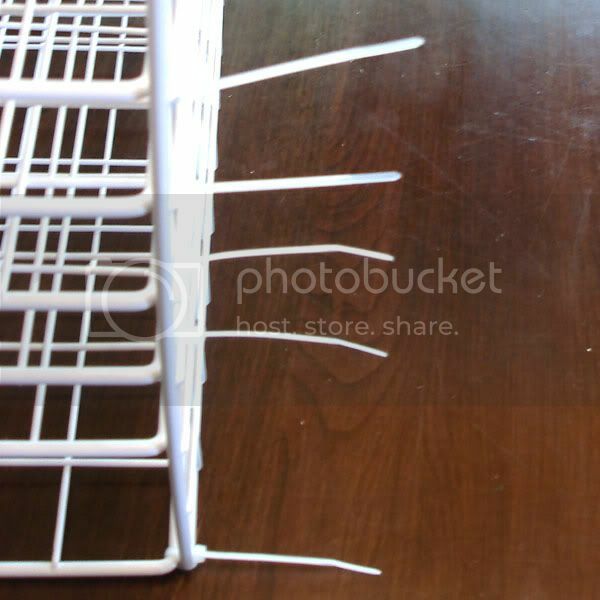 I had fought with those stupid plastic clips for years while using those racks for various things in college. Thanks goodness I decided to keep them instead of chuck them out even though i was mad at them, cause this is a fantastic use!!!! This is a wonderful idea! I even have zip ties lying around and only have to get the shelves! My only question and concern is I am wondering if this could accommodate for vertical storage? I currently store my paper vertically, I wonder if this would work by just turning it on its side? What a great idea! 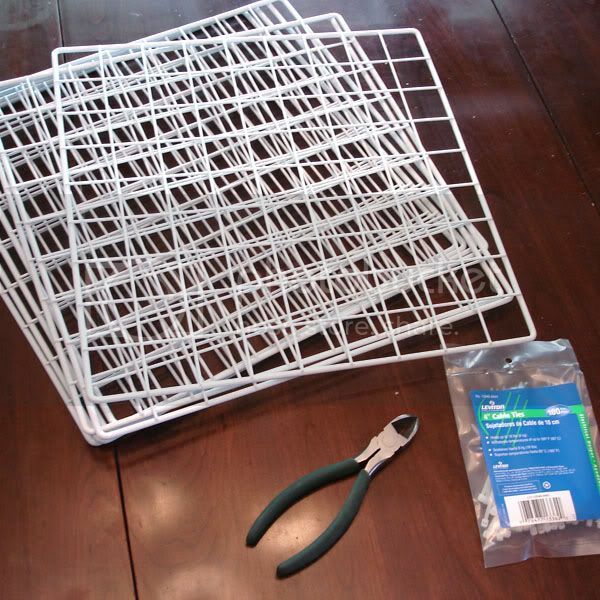 I, too, have parts for these wire cubes lying around at home, and I can't wait to assemble one of these storage solutions! 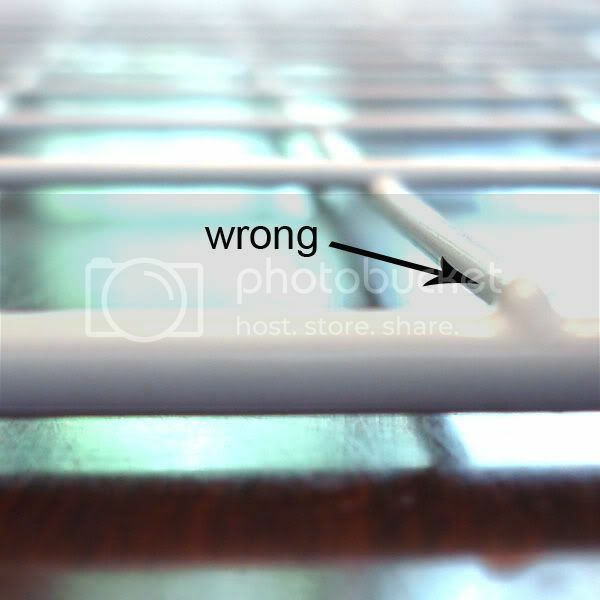 One word of caution, though, is that when you cut zip ties, the edges can be really sharp. So, I use a match to melt the edges and "dull them down." Don't leave the heat on for too long, though, or the plastic will burn and turn black. Great Idea! I found this idea a few years back on 2peas website. It may have been you that posted it. It works great for me too. The edges of the zip ties are VERY SHARP. I have a scar on my arm from one. The idea of melting the end is great. I too was wondering about setting it on it's side to make looking at the paper a little easier. Emilie - this looks very cool! Thanks for sharing the idea and the well written instructions! what a fantastic idea! I have the white storage cubes from ACMoore with the dividers (vertical) that I use for my cardstock. The paper seems to curve with the vertical storage. Ooh! Love this storage solution! I've been trying to figure out how to sort and store my paper. I haven't done anything yet, this is something I'm definitely going to try! Thanks so much for the tutorial! This idea is incredible. I've been using one of these cube systems since my college days, and I've never been able to part with it. I've always thought, "Too bad they don't make these for scrapping; they're the perfect size." AND LOOK NOW!! I will have to try this out. Thank you! I've been using mostly Sterilite stackable 12x12 storage units. I like being able to hide stuff away in drawers. But the price on these really adds up, and the space they consume dwindles quickly. Thanks so much for the idea and the great directions - I think I can actually make one of these! I currently use some of the sterilite stackable drawer units, but I find them to be cumbersome sometimes when trying to find just the right sheet of paper. I also have some expandable file things that I found one time on eBay - they are sort of like little suitcases with about 20 pockets each on the inside - handy sometimes, but the suitcase flap on top gets in the way a lot of the time. Another good idea is to take the priority mail boxes that you might get when you order scrapbook kits or supplies, and cut them down, and cover them with decorative paper - they make nice vertical paper holders for almost nothing - I recently got that idea from simplyscrapping.com. Aren't you the clever one! Have you tried standing the paper vertically? That's the way I store my pp and cs. Wonder how that would work. I have 4 of these, 5 feet tall in my scrapbooking room! My grandmother did this about 20 years ago to organise her paperwork in her home office--works well if you remember to pull the zipties really tight. So...not a new idea, but a good one. Your Grandma was pretty cool! I never would have thought of this on my own. Each time I have posted this many people comment that they have never heard of it, so I think it's definately an oldie but goodie! I have never personally tried it to store vertically. I can't see a reason why it wouldn't work. Try it out and let us know! I have used these for a few years now. I love them! It's very easy to add or remove shelves as you need them. 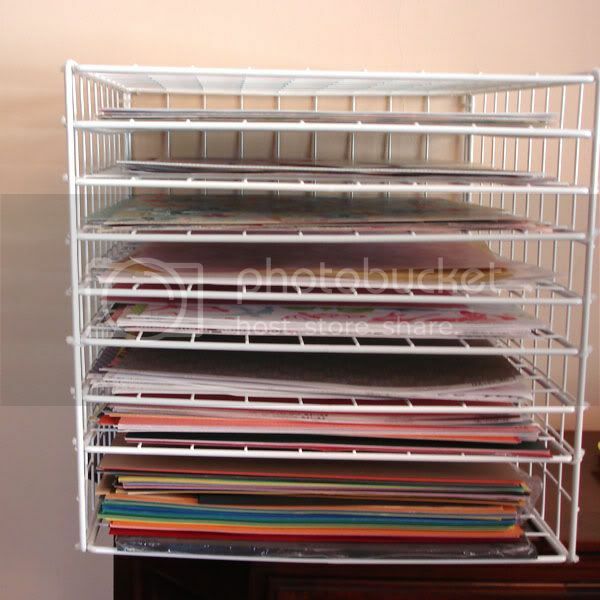 They also hold 4 of the vertical storage paper holders plus a couple of stacks. Cheap and super flexible! I love it! But i"m a little confused. You said to put them with the grid underneath, but in the pic, you have the grid on top so there is no lip. Did I read it wrong? Hi, I'm from europe and i've searched EVERY online store available, and I cannot find one that ships to Portugal. Currently I have just one alternative that charges me around 100$ for 3 boxes without the connectors. Right now I'm willing to pay someone who can buy and send to me some of these.